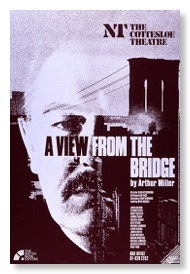 Click on the links in the blue bar at the top of the page or at the right to find out more about Alan Ayckbourn's acclaimed 1987 National Theatre production of Arthur Miller's A View From The Bridge. A View From The Bridge is one of Arthur Miller's most famous plays, first presented in 1955 as a one-act verse drama before being revised in 1956 to a more traditional two-act prose play. In 1987, Alan Ayckbourn directed the play at the National Theatre, London, with a cast led by Michael Gambon. The award-winning and highly acclaimed production cemented Alan's reputation as a director and also drew praise from the author himself.